Meet & Greet Procedure: After you pick up your luggage, please call Customer Service at (970) 261-6509 to let us know that you are ready to be picked up. Your Driver will pick you up within five minutes after your call. 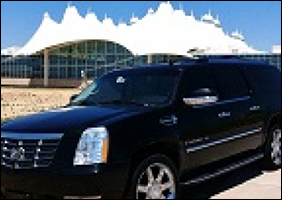 Black Diamond Cars is proud to provide Denver Airport transportation like no other. Our fleet includes stunning vehicles like the luxurious Mercedes-Benz GL sport utility vehicle, the classic Cadillac Escalade ESV and the magnificent Mercedes-Benz Sprinter luxury van for larger groups. These full-size luxury passenger vehicles offer the comfort, style and safety you look for in a luxury airport car service. When you choose Denver Airport transportation from Black Diamond Cars, you and your party can expect to enjoy a comfortable, quiet mountain transfer in any one of our exceptional fleet vehicles, chauffeured by a professional driver. Sit back, relax and enjoy yourself in an elegant environment tailor-made for your comfort as you travel to your ultimate destination. After a stressful day of travel, experience the quiet serenity of riding in climate-controlled comfort as you leave the driving to us. If you need to conduct business during your drive, our airport car service can offer you the convenience of easy internet access with complimentary WiFi, iPod and MP3 hookups, and seatback-mounted television monitors. If you prefer to relax in style, we also have movies, magazines, bottled water and refreshments upon request. For families and small groups who demand elegance and style in an airport car service, Black Diamond Cars delivers. Our fleet was built to handle Colorado roads, and can take on winter road conditions with ease. You'll experience a comfortable and safe mountain transfer every ride, every time. The Mercedes-Benz GL has even been referred to as “the ultimate snow machine”. Rest assured you are in capable hands with our Denver Airport transportation service. Our drivers are well trained and all our vehicles are equipped with the latest safety features and have been awarded high safety ratings by the automotive industry. You can be confident that you are well protected as you travel from Denver International Airport to various destinations around Colorado. When you desire a safe, reliable, luxurious experience in a safe and elegant vehicle, Black Diamond Cars is here to offer you excellent customer service and unsurpassed luxury with our dependable, executive-level airport car service. Call us today at (970) 261-6509 or email us at contactus@blackdiamondscars.com to book your private Denver Colorado airport transportation.